Missed registration? It's not too late! In addition to the regular 16 week semester courses, there are 4- to 15-week Late Start class options available. Choose from a variety of subjects, courses and start dates. New Student? Apply for Admission. 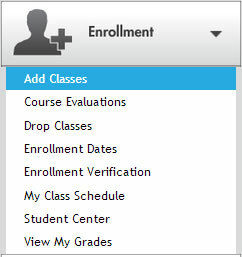 Expand the "Enrollment" section and select "Add Classes." Search for individual program classes or course subjects by choosing "select subject"
If you have specific requirements or preferences, you can narrow down your search by a number of other factors. Click SEARCH once you have chosen all your preferred criteria. If you get more than 50 results, you will see a message prompting you to click "OK" to continue. Click "OK" to continue or "Cancel" to edit or narrow your search. 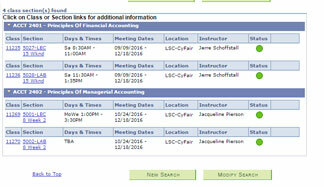 Once you have searched for classes, you will see search results with available sections and course descriptions. Take note of the Class Meeting Dates. After finding a class you wish to take, click "select class." Double check that the class works for you and click "NEXT." The class has been added to your shopping cart, once you have all your classes added to your shopping cart, click "Enroll"
Under the Enroll tab, you'll see your semester shopping cart. When you're ready to "check out," click "Proceed to Step 2 of 3." Confirm your classes when everything looks good and you're ready to enroll, click "Finish Enrolling." Once enrolled in Late Start classes, you will need to pay for those classes immediately to guarantee enrollment in those classes.